Chris Mayer tracks real estate at Columbia’s business school. He says reality is finally sinking in for home sellers. CHRIS MAYER: There’s an initial loss and people are looking at this and saying, but God, I paid $400,000 for the house. I’m just not going to sell it at $300,000. And over time, people realize that $400,000 isn’t coming back and they adjust their expectations. According to the report. quarter of all homes that are for sale have dropped in prices at least once. Behavioral economists say, homeowners are going to feel pain every time they drop prices that is comparable in magnitude to the pain felt with the first price drop. What does it mean for those who have their house on the market? Emotionally, it is better for them to calculate more accurately the required price drop and do it once rather than do it in steps. Behavioral economists like Dan Ariely and Cass Sunstein are in one way or another have been associated with President Obama’s campaign or administration. It appears people who pitch the President are also taking lessons from the behavioral economists. The general recommends 40,000 troops. I bet this will be the option he will end up getting, except that the President understands behavioral economics as well and may look beyond this versioning. Seth Godin, a marketing trendspotter, calls this the “affordable premium” product, which, like a McDonald’s coffee, is deemed to be worth more than it costs. 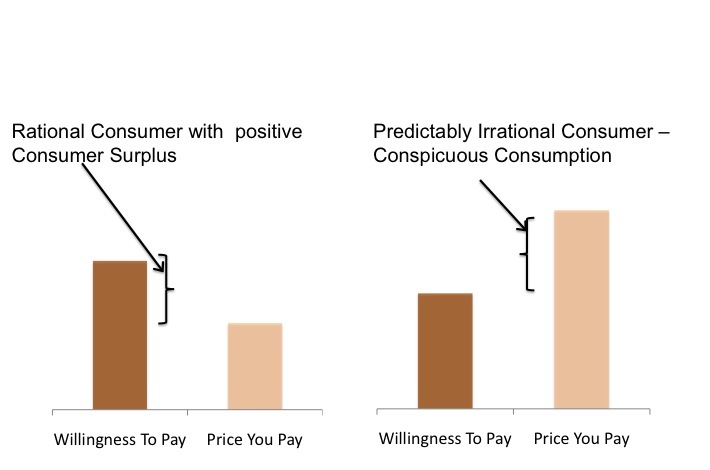 If we are rational (left image) we should only be buying products that leaves us a positive consumer surplus. What Mr.Godin suggests (or to be specific the FT’s quote states) is that we have been behaving like the right image. Our consumptions were hedonistic and we convinced ourselves that the products are really worth more than the price we paid for them. Our consumptions were conspicuous – that is we have been doing them for keeping up with appearances and with the Joneses. Availability of easy credit and high home prices drove us to behave like the right image and buy things that we were not getting the value for the price we paid. Now with bad economy we see the reversal to the expected rational behavior. The bigger question is how do consumers value the products they buy? Even consumers do not know the exact dollar figure of value. A marketer can tease out this value and make a reasonable estimate of the relative weights we assign to the components of a product like is utility, hedonistic value, brand and luxury. Next up I will discuss the factors that go into the valuation and the current shift in consumer valuation.